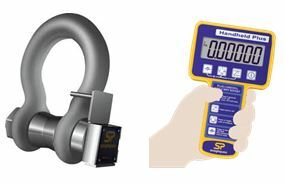 Our range of shackle load cells are simple to install and range from 1t – 1000t capacities available. At the core of the product line for over a decade, the cabled Load Shackle has surely helped shape the modern load monitoring industry. Manufactured from industry leading G2130 & G2140 Crosby high carbon steel shackles, the product offers reduced overall weight and headroom providing a great fit for low headroom applications. Utilising the same advanced microprocessor based electronics our cable Load Shackle benefits from high sampling rates, extreme resistance to industrial level noise and unprecedented stability. This high stability provides the product with over 5000 divisions and the highest standard resolution of any high capacity Load shackle on the market today. The cabled Load Shackles are also environmentally sealed to IP67 and as an option, sealed for permanent submersion to 100 metres for sub-sea use.